Many thanks to Status Quo who have added a link to this blog from their official site. Welcome to the Roots Replicas guitar building blog. This blog will record the progress of a Status Quo replica guitar build from start to finish as well as throwing in some Status Quo bits and pieces, facts and figures, pics and some of my favourite YouTube clips along the way. 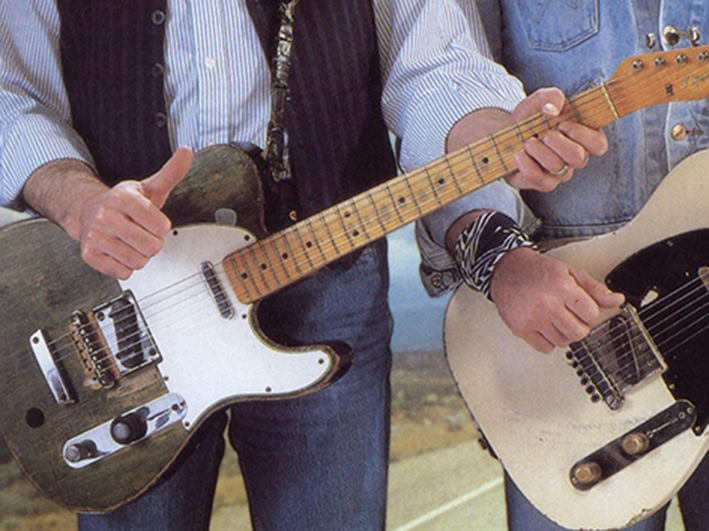 The guitar we are going to build is the famous green Fender Telecaster, as used by Francis Rossi of Status Quo. The particular period in time we are capturing for the build is 1985–86, which is around and just after the time of Live Aid (1985). Why this version of the guitar? Francis’ Tele has undergone many changes over the years, but this classic configuration happens to be my personal favourite. 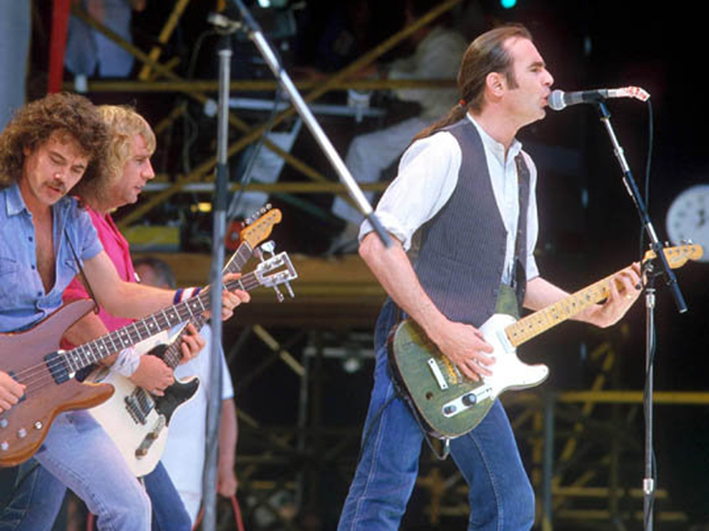 More importantly though, this version of the Tele is responsible for the iconic Quo sound from the early albums through to the last recording of Never Too Late (UK release: 13 March, 1981) with the original line-up and then Live Aid in 1985. The guitar remained unaltered until the early ’90s when major changes were made firstly with the installation of the three lace sensor pickups and 5-way switching, the G&L bridge (1995) and the addition of the 22nd fret. From this point onward the guitar took on a different tone and at times almost sounded like a Stratocaster. So, whilst we are concentrating on the ’85–86 period, we are dealing with a configuration which had come into being around 1971 and lasted until the early ’90s. The guitar looked pretty much the same throughout this entire period with the exception of a few small details which came and went along the way. The year this guitar came out of the Fender factory is anyone’s guess, so rather than attempting to put a definitive date on it, let’s go with what is currently on record. Most sources of information, both in print and online (including the main Status Quo website), date this guitar as a 1957 model. However, I have also read something that Status Quo Guitar Tech, Lloyd Gilbert wrote some years ago, saying that Leo Fender (who actually worked on the guitar at some point) confirmed the date of the neck as being 1959. The guitar started life as a standard model finished in sunburst when purchased by Francis, second-hand, for £70 in 1968. However, it wasn’t long before he rubbed down the sunburst finish as he wanted the guitar finished in natural wood, but then he changed his mind and decided to paint it black. However, the black paint looked horrible, so the front and back were rubbed down yet again but with the edges remaining black. Francis then repainted the front with some green paint that was hanging around, leaving the back as bare wood. The guitar was hurriedly reassembled to go and play a gig and has remained that way ever since… the paint job was never finished. The iconic ‘hole’ drilled into the body of the Tele still remains a mystery… Francis has alluded to a couple of explanations regarding the hole over the years, the most plausible being that the hole was drilled in order for the guitar lead to be threaded back through it whilst on stage to stop it being ripped out of the jack when stepped on by another band member. However, all members of the band have been threading their guitar leads back over the strap studs in every pic that I’ve ever seen and so I’ve never seen the hole being utilised in this manner. Another explanation offered by Francis is that instruments were routinely ‘nicked’ from backstage at gigs back in the day and that the hole served as a place to thread a bicycle lock though to secure the Tele to something solid! So, the paint job was done and the hole was drilled, but the the guitar still featured the standard Fender bridge plate and three-saddle setup. The problem with standard three-saddle setups on Telecasters is that you simply cannot set the intonation correctly on all six strings. When one of any two strings sharing a saddle is intonated the other will be out of tune. So, unless an out-of-tune compromise is reached for all strings, only three out of six can ever be intonated correctly. To eliminate all of these issues, the standard bridge plate was literally sawn in half to house the bridge pickup alone. The strings were now routed over a Gibson Tune-o-matic bridge (enabling each string to be intonated independently) and anchored by a tailpiece taken from an old semi-acoustic which was literally screwed directly into the body. The fact that the strings are not routed through the body (as standard on Teles) and that the action is slightly high (owing to the Tune-o-matic) gives the guitar a sound which is essentially ‘Tele’ but is also unique at the same time. 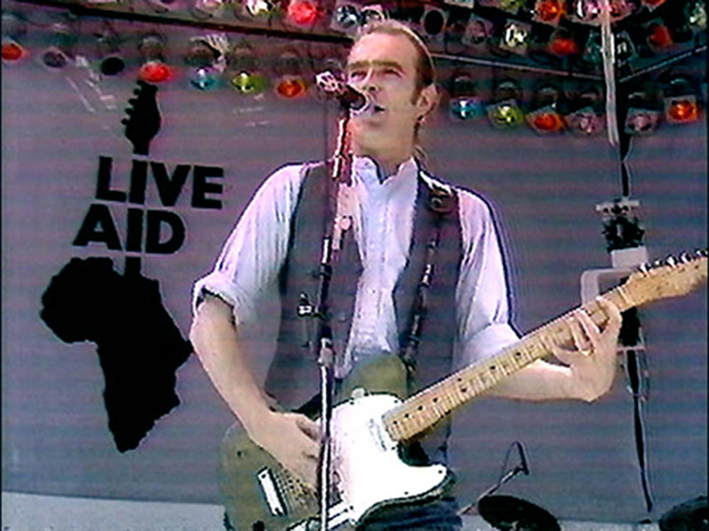 The images above are two of a surprisingly small number of pictures taken of Quo at Live Aid (13 July, 1985), but they do show Francis with the guitar and are quite clear. Looking at the pictures they appear to be playing Caroline which followed Rockin’ All Over The World (the opener for Live Aid) and preceded Don’t Waste My Time on that day in July 1985. These two images were taken less than a year later and are from the cover of the 7″ vinyl single of Rollin’ Home (UK release: 9 May, 1986) and we will be using them as our primary reference for the build. Francis’ guitar was unchanged from Live Aid in these pics and they show lots of close-up detail. There are other good references around, such as the 1986/87 In the Army Now tour programme (The Armoury) or the inner sleeve (vinyl only) of the In The Army Now album (UK release: 26 August, 1986) both of which show some good close-ups. There are even a couple of ‘replica’ guitars used regularly on the tour. These are commonly known as the the ‘Down Down’ guitar and the ‘Whatever You Want’ guitar. The DD guitar is a close replica of the main Tele but the green colour is slightly off and the sides are a darker green instead of black and there is no wear and tear visible. The reason for the DD guitar’s existence is to have an open B (DGDGBD) tuned guitar (with capo at 4th fret) ready and waiting for the performance of Down Down. The WYW guitar is yet another replica, but with a drop-D (DADGBE) tuning and features a humbucker neck pickup. We’re not actually building either of these guitars, but they’re worth a mention as ‘replica’ guitars from within the Quo camp. 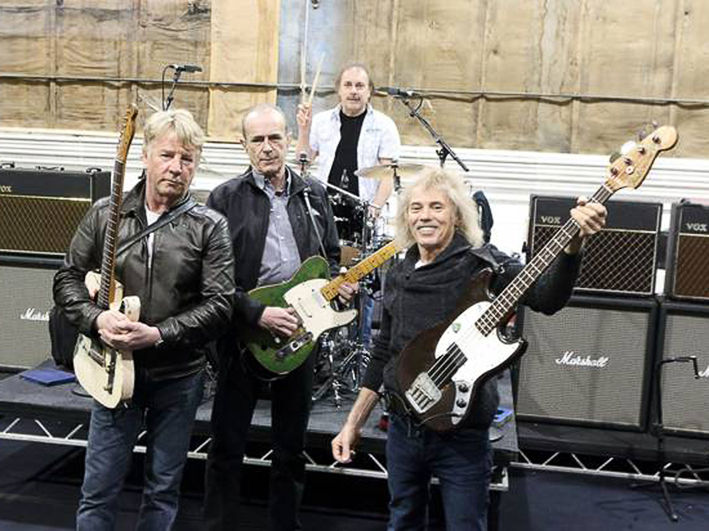 …but that all changed in 2012 when the original four…the Frantic Four, reunited for the first time in over 30 years at Shepperton studios for a ‘one-off’ jam during the making of Hello Quo (UK release: 22 October, 2012). Check out this awesome clip of In My Chair from the Shepperton jam. 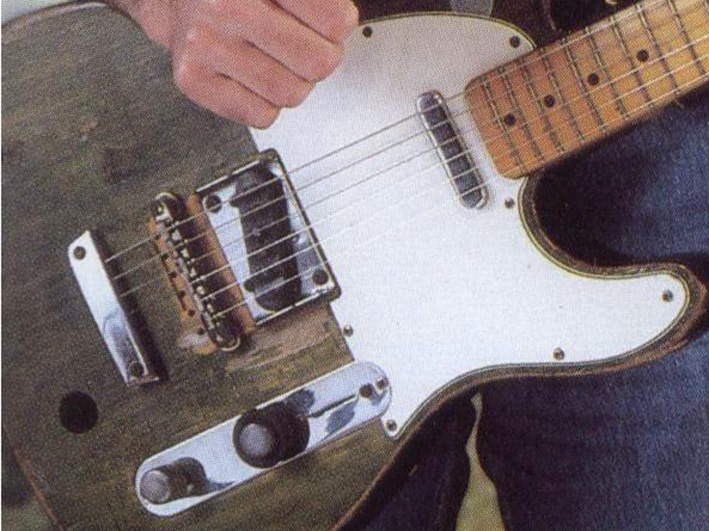 The green Tele looks a lot older and more road worn than it did back in 1985 and it was pretty worn back then! On the back of that jam came something that no Quo fan thought that they would ever see. 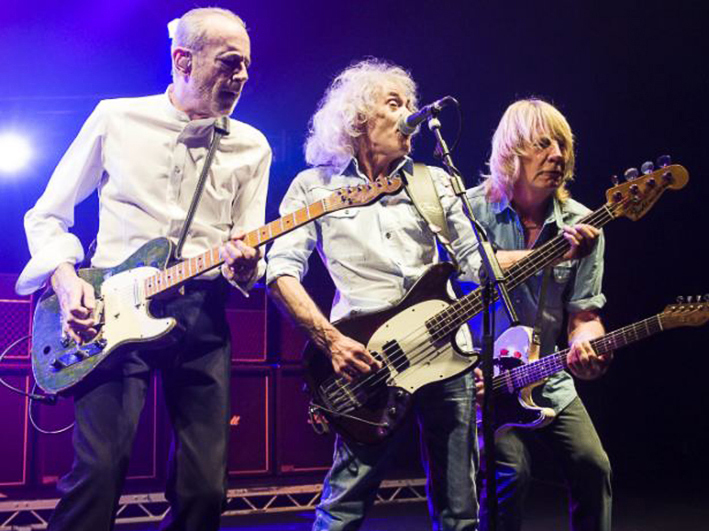 In March, 2013 the four original members; Francis Rossi (lead guitar, vocals), Rick Parfitt (rhythm guitar, vocals), Alan Lancaster (bass guitar, vocals) and John Coghlan (drums) played a 9-date set of gigs in the UK. The gigs were so successful that they returned in 2014 with a 16-date tour taking in Germany, Holland, Belgium, France, UK and Ireland. The green Tele was still very much in use and was used for all of the Frantic Four gigs. Sadly, it was retired towards the end of 2014 owing to problems with tuning as a result of wood softening and has been replaced by a custom-built Status graphite model which is now Francis’ main guitar. I have a sneaking suspicion that the green Tele may return one day as it can’t be beyond the realms of modern technology to restore it. But if it really has gone forever, I would have to say that Francis only has to get in touch with me and I’ll build a new (old) one for him! Thanks for reading the introduction and background to this project, we are now ready to start building! Please click here to learn how this guitar was built, with step-by-step descriptions of each stage along with lots of Status Quo background info, pics and some of my favourite YouTube clips along the way. Hi I am in the process of making a Rick Parfitt replica from my old Squier Telecaster (but using wherever possible Fender parts ). The only change that I am going to make is I am going to drop an Ibanez pickups in the bridge and (if possible ) in the neck. Thanks, and best of luck with your build! Hi, I only make one (possibly two) a year and the guitar(s) would be auctioned at the end of the process. Hi, really enjoyed reading through your blog on Rossi’s main axe and how you built your replica’s. I’ve been trying to find a guitar luthier who would be up for doing the Rossi conversion on my telecaster (The tune-o-matic and tailpiece identical to your replicas). Not sure if you do this sort of work but trying to find someone who does Quo conversions for tele’s seem to be far and few between. I’d really appreciate it if you could help me out or point me in the right direction. Hi Will, thanks for checking out the blog. Setting up and intonating the guitar after modding can be tricky, so If you’ve not worked on guitars before, I would strongly recommend finding a professional luthier to carry out the work for you. The hole in the green telecaster is pretty much where the pivot might be for a B bender mod. Is it possible the instrument ever had one fitted ? It certainly is close to the position for a B-B mod, but maybe an inch or so too low? Not a bad theory though. I’m sure it will remain a mystery. Thanks for checking out the blog. HI RR. absolutely love the Green Telecaster. Will there be another for sale in the very near future? Hi Alan, Numbers 3 and 4 are both now sold I’m afraid. Any news on new builds will be posted on this blog. Many thanks for your interest. Thanks for getting in touch and for sending me the link. Unfortunately I can’t get the Facebook link to work, is it some new pics? Can you get in touch with me on email so I can send you the pictures? Awesome article! Any idea what wood his Original Tele body is made from? I’ve always loved the idea of a Tele with a tune-o-matic bridge. My technique has developed over the years to incorporate a lot of palm muting especially with lead lines. The tune-o-matic bridge makes palm muting a dream so having it on a tele would be pretty epic. Hi there, Francis’ original tele body is a 3-pc made of swamp ash. Adding the ToM bridge to a tele is not too hard, it’s just the drilling of the stud holes that can be tricky. On my replicas I add the bridge as parallel to the tailpiece (for authenticity) the intonation suffers slightly but not enough to cause any real problems. In truth the bass end of the bridge should be offset by 2 or 3 degrees (anticlockwise) to allow you to intonate the guitar more precisely (see my ‘Bridge’ page). What shade of green paint do you use? It’s a colour I mixed years ago and is similar to outdoor fence paint.